What do you get when you combine comfort food with junk food and add a healthy spin? 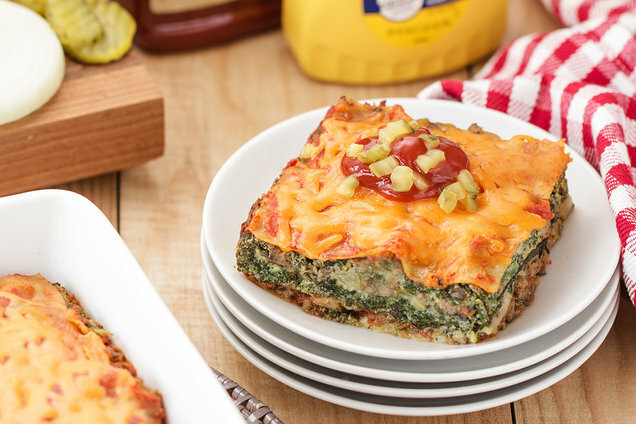 This cheeseburger-inspired lasagna, filled with veggies and lean protein! Aren’t casseroles like this just PERFECT this time of year? Preheat oven to 400 degrees. Spray a baking sheet and an 8” X 8” baking pan with nonstick spray. Slice off and discard zucchini ends. Cut zucchini in half widthwise, and cut each half lengthwise into 1/4-inch-thick strips. Evenly lay zucchini on the baking sheet, overlapping if needed. Sprinkle with 1/2 tsp. each garlic powder and onion powder. Bake for 10 minutes. Meanwhile, bring a large skillet to medium-high heat. Add beef, mushrooms, onion, and remaining 1/2 tsp. each garlic powder and onion powder. Cook and crumble until beef is fully cooked and veggies have softened, 5 - 7 minutes. Remove skillet from heat, and stir in mustard and cream cheese until uniform. Flip zucchini. Bake until softened, about 10 more minutes. Meanwhile, in a medium-large bowl, combine spinach, ricotta cheese, egg, salt, and pepper. Mix until uniform. Remove sheet from oven, and increase temperature to 425 degrees. Evenly layer ingredients in the baking pan: half of the sliced zucchini, half of the beef mixture, 1/2 cup crushed tomatoes, 2 lasagna sheets, and half of the spinach mixture. Repeat layering with remaining zucchini, beef, and spinach mixture, followed by remaining 2 lasagna sheets, and remaining 1/2 cup crushed tomatoes. Top with cheddar. Cover pan with foil. Bake for 30 minutes. Remove foil and bake until lasagna sheets are cooked through and cheese has lightly browned, 8 - 10 minutes. HG FYI: If you can’t find whole-grain/whole-wheat oven-ready lasagna sheets at the supermarket, stock up online. Or use regular oven-ready sheets instead, which have slightly less fiber. Gift Find of the Day: Design Your Own Apron! Fact: Anyone with a kitchen (and a torso!) could use a good apron. And the cute customizable ones over at Flirty Aprons are as good as it gets! Choose from tons of patterns and shapes (including ones with sassy ruffles and bows). Then add your text (you can even choose the font! ), and you’re good to go. Add a name, a nickname… Whatever! We suggest getting one for yourself as well as a friend or two. Our pick? 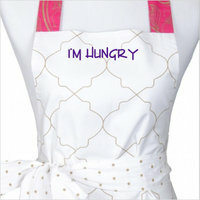 This white & pink patterned apron with I’M HUNGRY written in purple! P.S. Don’t feel like customizing? Flirty Aprons has an awesome selection of ready-to-wear finds, like this holiday-themed “love” one! Hungry for More Healthy Casserole Recipes? Grab your aprons! Just so you know, we may receive compensation from some of these links. Hooray, hooray: Today, November 27th, is National Craft Jerky Day! One of our go-to gourmet meat snacks will always be the kind by Simply Snackin’... Try it and you’ll know why! Share all the comfort-food goodness! Click "Send to a Friend" right now.